Oregano is the common name for a perennial herbaceous plant, Origanum vulgare of the mint family (Lamiaceae), characterized by opposite, aromatic leaves and purple flowers. Another common name for this herb is wild marjoram (Bender and Bender 2005; Herbst 2001). Oregano also is the name employed for the leaves of this plant, used as a popular seasoning. There are other aromatic plants both in and outside the mint family that use oregano as part of their common name. Plectranthus amboinicus in the mint family is known as "Cuban oregano" (as well as "Spanish thyme," "Mexican thyme," or "Mexican mint"). It is a tender, fleshy perennial plant with an oregano-like flavor and odor. Lippia graveolens in the verbena family (Verbenaceae) is known as "Mexican oregano." It is closely related to lemon verbena. Lippia graveolens has a very similar flavor to oregano, but is usually stronger. It is becoming more commonly sold outside of Mexico, especially in the United States. 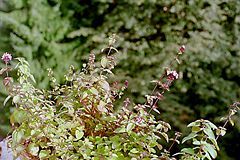 Among other plants sometimes referred to as oregano are included Origanum maru (Syrian oregano or Egyptian marjoram), and O. onites (Cretan oregano or pot marjoram) (Rogers 2004a, 2004c; USDA 2008). Because several species actually contribute to the oregano as a commercial culinary herb, including the subspecies O. vulgare hirtum along with Thymus capitatus and T. mastichina, oregano sometimes is considered more of a flavor than a particular species (Rogers 2004b). With a name derived from the Greek for "joy of the mountain" (Herbst 2001), oregano is one of the world's more well-known and useful plants, with the leaves popular for flavoring food, and the essential oil adding additional medicinal values. As a culinary spice, oregano's strong, pungent flavor and aroma has added to the human enjoyment of many foods, and is considered an indispensable ingredient in Italian and Greek cuisine. It serves as a culinary herb added to meat, soup, and sausages, among others, and is particularly popular in tomato-based dishes and pizza. Lamiaceae, the flowering plant family to which oregano belongs, has about 210 genera and some 3,500 species. Lamiaceae plants are frequently aromatic in all parts and include many widely used culinary herbs in addition to oregano, such as mint, rosemary, sage, savory, marjoram, basil, thyme, lavender, and perilla. Many members of the family are widely cultivated, owing not only to their aromatic qualities but also their ease of cultivation: these plants are among the easiest plants to propagate by stem cuttings. Besides those grown for their edible leaves, some are grown for decorative foliage, such as coleus and snow-on-the-mountain. Others are grown for food purposes, but seeds are utilized instead of leaves, such as with chia. The leaves emerge oppositely, each pair at right angles to the previous one (called decussate) or whorled. The flowers are bilaterally symmetrical with five united petals and five united sepals. Origanum is a genus of about several species native to the Mediterranean region east to eastern Asia. 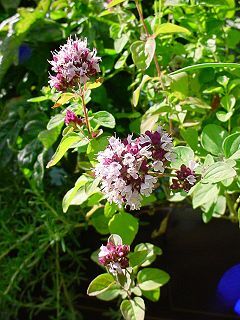 The United States Department of Agriculture lists six recognized species for the genus and the following common names: Origanum heracleoticum, Origanum majorana (sweet marjoram), Origanum maru (Egyptian marjoram), Origanum onites (pot marjoram), and Origanum vulgare (oregano). Other sources include such species as Origanum sipyleum (showy pink oregano) and O. syriacum (a synonym of O. maru, and sometimes known as Syrian oregano or Bible hyssop) (Rogers 2004). Majoram ('Origanium hortensis'), considered by some to be a species of oregano, is another very important culinary herb in addition to oregano. Origanum vulgare is native to Europe, the Mediterranean region, and southern and central Asia. It is a perennial herb, growing to 20-80 centimeters tall, with opposite, ovate, dark green leaves one to four centimeters long, with small depressions. The flowers are purple, three to four millimeters long, produced in erect spikes. It has a creeping rootstock, with a square, purplish stem (Rogers 2004b). The name oregano and origanum derives from the Greek origanon ὀρίγανον oros ὄρος “mountain” and the verb ganousthai γανοῦσθαι "delight in." This could be because oregano growing wild has a preference for higher altitude in the Mediterranean climate, although a pre-Greek or Semitic origin of origanum is also possible (Rogers 2004b). Oregano growing in a pot. The subspecies of oregano, Origanum vulgare hirtum, is an important culinary herb. It is particularly widely used in Greek and Italian cuisines. Rogers (2004b) states that it is a condicio sine qua non (indispensable) in Italian cuisine, being used for tomato sauces, grilled meat, and fried vegetables, and that together with basil makes up the character of Italian dishes. Oregano also is considered an indispensable ingredient for Greek cuisine. Oregano adds flavor to Greek salad and is usually used separately or added to the lemon-olive oil sauce that accompanies many fish or meat barbecues and some casseroles. Oregano is considered similar to marjoram in flavor, but not as sweet, and with a stronger, more pungent aroma and flavor (Herbst 2001). Marjoram differs significantly in taste because phenolic compounds are missing in its essential oil. Some varieties of oregano exhibit a flavor intermediate between oregano and marjoram. 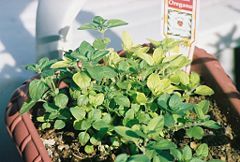 Overall, oregano has an aromatic, warm, and slightly bitter taste. It varies in intensity; good quality is so strong that it almost numbs the tongue, but the cultivars adapted to colder climates have often unsatisfactory flavor. The influence of climate, season, and soil on the composition of the essential oil is greater than the difference between the various species. The related species Origanum onites (Greece, Asia Minor) and O. heracleoticum (Italy, Balkan peninsula, West Asia) have similar flavors as Origanum vulgare. It is the oregano leaves that are used in cooking, and the dried herb is often more flavorful than the fresh (Katzer 2007). Oregano leaves are more flavorful when dried. Oregano combines nicely with pickled olives, capers, and lovage leaves (Rogers 2004b). In particular, pizza is associated with oregano. Unlike many Italian herbs, oregano works with hot and spicy food, which is popular in southern Italy (Rogers 2004b). The herb was almost unknown in the United States until World War II, when soldiers returning from Italy raved about it (Herbst 2001). Today, the United States is one of the primary sources of oregano, along with Italy, Greece, Spain, and Turkey. Oregano has been used medicinally since the time of the ancient Greeks and Chinese (Rogers 2004b). The Greeks used it in the form of compresses to treat sores and aching muscles and the Chinese used it to relieve fever, diarrhea, jaundice, itchy skin, and vomiting (Rogers 2004b). Oregano essential oil contains two primary compounds, thymol and carvacrol, which also are found in thyme and help to loosen phlegm in the lungs and relieve spasms in the bronchial passages (Rogers 2004b). Thymol is included in some commercial cough remedies, such as cough drops and Vicks VapoRub (Rogers 2004). These substances, along with borneol and caffeic acid, other constituents of the essential oil, are said to help with digestive function (Rogers 2004b). Oregano is high in antioxidant activity, due to a high content of phenolic acids and flavonoids (Faleiro et al. 2005; Dragland et al. 2003). Additionally, oregano has demonstrated antimicrobial activity against food-borne pathogens such as Listeria monocytogenes (Faleiro et al. 2005). Both of these characteristics may be useful in both health and food preservation. Dragland, S., H. Senoo, K. Wake, K. Holte, and R. Blomhoff. 2003. Several culinary and medicinal herbs are important sources of dietary antioxidants J Nutr. 133(5):1286-90. Retrieved April 16, 2008. Faleiro, L., G. Miguel, S. Gomes, L. Costa, F. Venâncio, A. Teixeira, A. C. Figueiredo, J. G. Barroso, and L. G. Pedro. 2005. Antibacterial and antioxidant activities of essential oils isolated from Thymbra capitata L. (Cav.) and Origanum vulgare L. J Agric Food Chem. 53(21):8162-8. Retrieved April 16, 2008. Katzer, G. 2007. Oregano (Origanum vulgare L.) Spice pages. Retrieved April 16, 2008. Rogers, M. 2004a. Origanum genus Herbalpedia. Retrieved April 16, 2008. ———. 2004c. Oregano Herbalpedia. Retrieved April 16, 2008. ———. 2004c. Pot marjoram Herbalpedia. Retrieved April 16, 2008. United States Department of Agriculture (USDA). 2008. Classification for Kingdom Plantae down to genus Origanum L. Natural Resources Conservation Service, USDA. Retrieved April 16, 2008. This page was last modified on 3 January 2019, at 22:00.